Mouse anti Human Interferon gamma antibody, clone D9D10 recognizes both natural and recombinant human interferon gamma, binding only to the dimeric (functional) form. Mouse anti Human Interferon gamma antibody, clone D9D10 has been reported to neutralize the activity of natural and recombinant IFN gamma. Spleen cells from immunized BALB/c mice were fused with cells of the mouse P3X63-Ag-8.653 myeloma cell line. Andersson, U. et al. (1986) Phenotypic characterization of individual interferon-gamma-producing cells after OKT3 antibody activation. Eur J Immunol. 16 (11): 1457-60. Sandvig, S. et al. (1987) Gamma-interferon is produced by CD3+ and CD3- lymphocytes. Andersson U et al. (1988) Enumeration of IFN-gamma-producing cells by flow cytometry. Comparison with fluorescence microscopy. J Immunol Methods. 112 (1): 139-42. Horowitz, A. et al. 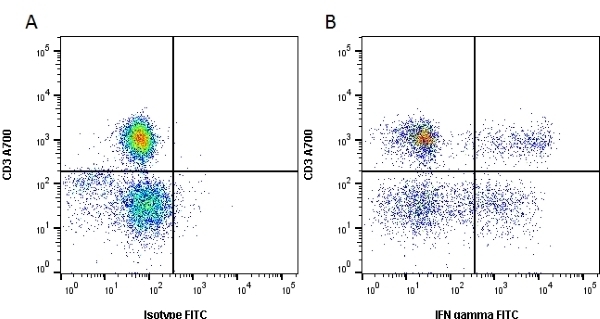 (2010) NK cells as effectors of acquired immune responses: effector CD4+ T cell-dependent activation of NK cells following vaccination. J Immunol. 185 (5): 2808-18. Buggins, A.G. ety al. (2001) Microenvironment produced by acute myeloid leukemia cells prevents T cell activation and proliferation by inhibition of NF-kappaB, c-Myc, and pRb pathways. Burton, O.T. et al. (2010) Roles for TGF-beta and programmed cell death 1 ligand 1 in regulatory T cell expansion and diabetes suppression by zymosan in nonobese diabetic mice. Cox, K. et al. (2005) Plasmacytoid dendritic cells (PDC) are the major DC subset innately producing cytokines in human lymph nodes. J Leukoc Biol. 78: 1142-52. Horowitz, A. & Riley, E.M. (2013) Activation of human NK cells by Plasmodium-infected red blood cells. Methods Mol Biol. 923: 447-64.